New York City building trades unions are in a fight that hits at the very core of their jurisdiction: big commercial office buildings. At $4 billion and 2.9 million square feet, 50 Hudson Yards will be the city’s most expensive and fourth-largest office building. And it’s just one of 16 skyscrapers slated for Hudson Yards, the largest private real estate development in U.S. history. This sprawling redevelopment of a former railyard is reshaping a section of Manhattan’s West Side, while employing an estimated 23,000 construction workers over the course of a decade. But after building the first phase of the project union, developer Related is trying to build the rest open shop, meaning a mix of union and non-union contractors. “If we lose this, that’s going to enable these contractors and developers to hire more and more non-union workers,” says Marvin Tavarez, a journeyman with Sheet Metal Workers Local 28. Tavarez and other rank and filers from different unions are pushing the notoriously splintered trades to make a united stand. They’ve been building solidarity with 6 a.m. rallies every Thursday outside the site. Even if a big project uses non-union workers, it generally requires some union members to get it done. This gives the trades leverage—if they stick together, which they generally don’t. Thus far, all trades have agreed not to send their members to work on the next phase of Hudson Yards, with one big exception: the Carpenters, whose members are working on the foundations. It’s unclear whether they’ll continue to work, or even take other trades’ work, once the job gets above ground. Related manages hundreds of millions of dollars of Carpenters pension fund money, and one Carpenters fund was part of an investment group that provided lending to build 10 Hudson Yards. The developer’s move wouldn’t even have been considered a few years ago, when big commercial projects were built union without question. But since then, an employer offensive has reshaped New York City construction. Unions are hemorrhaging market share. 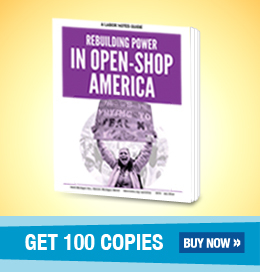 All of the city’s top general contractors now operate open shop, and several 50-story residential towers are currently being built with non-union workers. Contractors claim that an all-union project is 20 to 30 percent more expensive than one built open shop. Unions dispute that figure, arguing that increased costs are made up for by their members’ higher skill level. However, there’s a growing supply of non-union companies and workers with enough skills to do big jobs. Figuring out how to organize them will be critical to restoring the unions’ power in the market. The trades scored a win earlier this year at One Wall Street, getting the general contractor Gilbane, a top open-shop proponent, removed from the $1.5 billion condo conversion. The new general contractor is building the rest of the project union. In the One Wall campaign, the unions combined mass lunchtime and after-work rallies with pressure on the project's lenders, including Deutsche Bank. An ongoing building boom has kept most of the city’s 100,000 union construction workers employed, cushioning the impact of the growing non-union market. And the trades still control jobs built with public money, like the ongoing rehabilitation work at LaGuardia Airport. But members are worried about the future. “When this bloom slows down, we’re in big trouble,” says Mike Pierro of Glaziers Local 1087, who’s been working at Hudson Yards since August. He’s been handbilling the site before work for the Thursday morning “Count Me In” rallies. Union members are also frustrated with concessions they’ve had to eat in order to keep working while the non-union sector continues to grow. In 2012, when unemployment in the trades was high, Related threatened to use non-union contractors for the first phase of the project. In exchange for a project labor agreement (PLA) it extracted wage and benefit cuts and changes to work rules from unions. Union members disrupted Related's efforts to hand out thousands of free Thanksgiving turkeys to workers at Hudson Yards November 20, spreading the message to refuse the birds via leaflets, social media, and word of mouth. We said, "These guys are trying to give you a turkey like you're part of the family—but they're trying to take your wages and benefits and leave you out of the next job," said Brian Houser, a third-year apprentice with Elevator Constructors Local 1. There are about 4,000 construction workers at the Hudson Yards site, but the company ultimately gave out only 200 turkeys—and many of these ended up thrown in a van and donated to the homeless, as workers stood and chanted outside the site. Employers and construction unions negotiate PLAs to set wages and work rules before a large project is bid. PLAs like the one at Hudson Yards generally contain no-strike and no-picketing clauses—limiting the actions that workers already on the site can take, despite their frustrations. “You’ve got investors from around the world—they have the money—but they nickel and dime us, the workers, the spokes in the wheel,” says John Mele, a delegate with Carpenters Local 157 who’s working on the Hudson Yards retail mall, covered under the PLA. Now Related is refusing to sign a PLA for the project’s next phase, which includes 50 Hudson Yards and several big residential buildings. Threatening to build nonunion and playing on existing divisions between the trades, the developer has been trying to get individual unions to agree to work on this next phase anyway. Already the 51-story commercial office tower at 55 Hudson Yards is being built open-shop, with Gilbane as its general contractor. Related’s joint-venture partner in the Hudson Yards project is Oxford Properties, the real estate arm of the Ontario Municipal Employees’ Retirement System. How did the Carpenters District Council justify working on 50 Hudson Yards? “When we brought it to the delegate meeting, our leaders told us, ‘When we were on such and such a job at this address, the Latherers were crossing the picket line, the Steamfitters were crossing the picket line,” says Mele, who’s been joining the 6 a.m. rallies and urging his co-workers to do the same. One organizing tool used by New York construction workers is a cross-trades Facebook group, Union Building Trades of NYC, which tin knocker Martin Tavarez started as an apprentice in 2014. One reason he launched the group was to get info from members of other trades on whether rogue “yellow” unions were on their job sites, and if so, to try to get the work handed over to Sheet Metal Workers Local 28. Tavarez and others have used this network to organize a series of vigils for construction workers who died on the job. Thirty-one workers died on construction sites in New York City in 2015 and 2016; 28 were on non-union sites. In January, 31 union members—including Tavarez, Clancy, and elevator constructor Brian Houser—were arrested in an act of civil disobedience supporting Bill 1447, which would have required nonunion contractors to offer safety training comparable to that offered in union apprenticeships. In September, the City Council passed a version of the bill that will require workers to have 40 hours of safety training by 2020, up from 10 today. This network has helped lay the basis for the fight at Hudson Yards. A version of this article appeared in Labor Notes #466. Don't miss an issue, subscribe today. UBTNYC was built by Bill Abbate Jr.
You incorrectly omitted Bill Abbate Jr. from the UBTNYC attribution. Mr. Abbate is the person who was responsible for the building and success of the Building Trades group. It’s because of his vast contact list that UBTNYC took off as a grassroots movement. Mr. Abbate is the individual who popularized it, put a tremendous amount of his own money into it to make it a success. Mr. Tavarez named the group. Mr. Abbate should have been mentioned in this article. Just saying.